Opening hours: River cruise departs from Waterloo pier at the London Eye:	10.45am*, 11.45am, 12.45pm, 1.45pm, 2.45pm, 3.45pm, 4.45pm, 5.45pm* and 6.45pm**These cruise times are available April to October. Pick up point: To pre book your flight time you will need to contact the London Eye directly on 0870 400 3040. On arrival present your voucher to the operator at the pre-paid ticket desk.You will then be issued with two separate tickets, one for the London Eye and another for the River cruise. The London Eye and River Cruise and see London from a different perspective. Enjoy a unique 40 minute circular sightseeing cruise on the River Thames with fascinating live commentary that brings the city to life, presented by specialist guides. Highlights include Big Ben and the Houses of Parliament, St.
Paul's Cathedral, Tower Bridge and the Tower of London. Audio commentary is available in French, Spanish, German, Dutch, Italian, Russian, Japanese and Mandarin. T-loops system is also available. 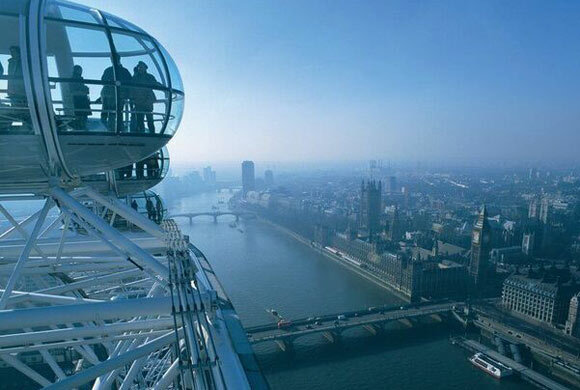 Fast track ticket, 30 minute flight on the London Eye, 40 minute sightseeing cruise presented by trained guides.